After a busy day of running errands, and visiting family, we needed a quick, easy and tasty supper. 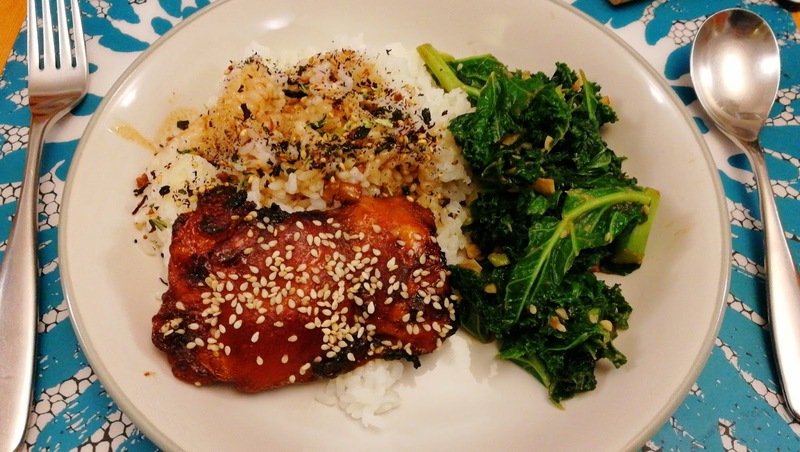 First I set the oven heating up to 200 degrees, and then I brushed a foil tray with oil and laid out a pack of boneless skinless chicken thigh fillets - unfolded so they were flat, and smooth side down - and then covered them over with a small bottle of Blue Dragon teriyaki marinade. I had planned to make my own, but I ran out of time, and this was my back up. If I'd had time, I would have left this to marinade for an hour, but I didn't have this luxury, so I drizzled on about a tablespoon of toasted sesame oil and popped it in the now hot oven for 20 mins. Meanwhile, I followed the packet instructions for a bag of sushi rice, up until the point where I cooked it in my rice cooker. No fuss no muss. After the 20 mins were up I turned the fillets over and sprinkled on some sesame seeds, then put them back for another 15-20 mins. Now I finely chopped some spring onions and fried the white part in a lightly oiled wok. I then added some chopped garlic. When both were soft and fragrant, I chucked in a bag of prepared kale. Big'Un isn't great with kale always and found it tough chewing (she's always had an issue with tough leafy foods) and her little brother kindly suggested that next time maybe we could try cavolo nero. I nearly choked for laughing at his terrible "overheard in Waitrose" comment!! Once the kale was properly mixed with the aromatics, I then added some soy sauce and about a tablespoon of crunchy peanut butter, thinned with a little hot water. Basically, I had an almost empty jar which I didn't want to waste, so I swished it out with boiling water and poured it all into the pan. 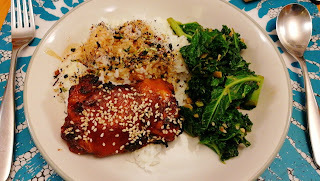 This did a nice job of thickening the sauce and also adding a subtle flavour and texture to the kale. Finally, I sprinkled on a few sesame seeds. Once everything was ready, I put the green parts of the spring onions out to be used as a garnish for the chicken, and I sprinkled the rice with mirin before serving. 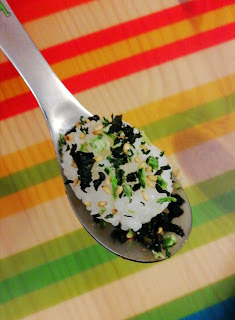 I also put packets of Tanaka Gohan sushi rice spice mix for sprinkling on the rice. There was also plenty of lovely sticky teriyaki sauce for the rice. The whole meal was a huge success. We also brought some sushi rice ball makers to the table for a little fun, and these were great too! We used these ones. Tiny hasn't always enjoyed sushi rice, but this way he definitely did! This was a definite "please do make this again Mama" meal!